Meizu showcased its new Super mCharge technology at MWC 2017, which claims to fully charge a zeroed-out battery in just over 20 minutes. The Chinese company’s third generation charging technology is going head-to-head with Qualcomm’s QuickCharge 3.0 (QC3.0) and apparently ousts it in a few keys ways. 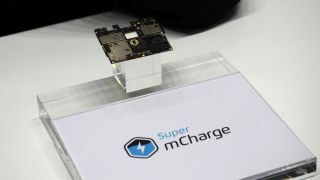 First off, Super mCharge utilizes its own cable and connector, in conjunction with its own 3,000mAh test battery, to bring an industry-leading five amp current that goes a long way in pulling in more power at a faster pace than Qualcomm’s standard. Yet somehow, Meizu’s technology can charge faster while keeping the temperature of the cable and thus, the device, lower. Compared once again to QC3.0, Super mCharge tops out at 39-degrees celsius (about 102-degrees fahrenheit) while the competition gets up to 85-degrees celsius. It’s impressive that Meizu can accomplish such a thing while maintaining a lower temperature, but that alone doesn’t really benefit the consumer in a tangible way. That’s compounded by the fact that this tech won’t show up in phones outside of Meizu’s own future devices. However, what is of more relevance is safety. Can Meizu guarantee that its new charging solution won’t be a fastlane to another fiasco like the one that the Note 7 brought on? OK then, I guess we’ll have to take his word for it until we see the tech (hopefully) showing up in a Meizu device later this year.